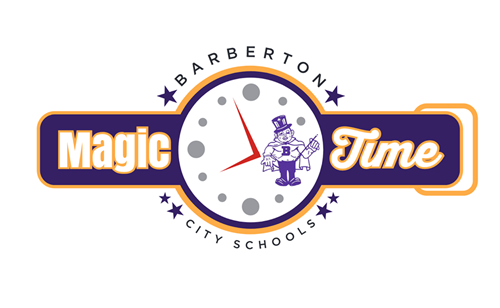 Barberton Preschool not in session on Magic Time Days. Parents, families, students, and community members. This coming year starting in September, each building will have a consistent delayed start called Magic Time once a month. Every building will be the same date however starting times will be different for each school. Last year we started several initiatives that will require our teachers to meet and discuss your children’s individual data and to make sure there is consistency from classroom to classroom. In order to do this, we will need extended time for teachers to meet on a monthly basis. We do not want this to be an inconvenience to anyone - on those days the teacher will start meeting during the teacher reporting time, before any students are in the building. It will spill over a bit into student reporting time. If you have to send your child to school at the normal time, there will be adults there to monitor them until these meetings are over. All busses and breakfast will run at the normal times for your convenience on these days. If you do not want to bring your child to school until the delayed starting time that day, you have that option as well. The principals will send the dates and times out to you and do broadcasts for reminders. This time will be invaluable to your child’s education and progress and it’s once a month. We appreciate your support and will continue to do everything we can to make your child’s experience here in the BCSD a success.